It is the Teenage Mutant Ninja Turtles 25th anniversary this week and at the New York celebration The Mirage Group has confirmed they will be returning to the live-action sphere with the Ninja Turtles. The film will focus specifically on the origins of the crime fighting foursome with a hopeful release date pending for 2011. Scott Mednick is producing the film and has said that the film will follow the original comics. "The original dozen comics created by Peter Laird and Kevin Eastman are some of the best source material one could hope for." 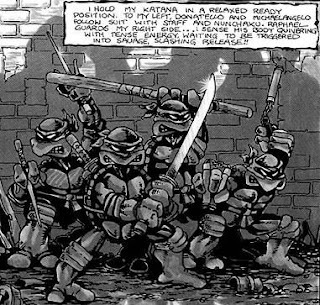 Which means we should get a far grittier take on the Ninja Turtles than we saw from the original live-action films. I wouldn't bank on that though, there is no way the film will be R rated and I will be surprised if it even warrants a PG13 rating. Update: Peter Laird, co-creator of the original comic series tells MTV, "I can say that at this point there are a lot of positive feelings about a Batman Begins-style ‘reboot,’ which would, of necessity, include a retelling of the Turtles’ origin story." Laird continued by adding, "I would also be into an all-new story, if it was decided that that was a more desirable direction. Either way is fine with me, to be honest!" Laird did finalize that the reboot will not just be the first comic. He said, "Simply telling the story of what happened in the first issue of the ‘TMNT’ comic book would be a pretty short movie, so I suspect other things from the Turtles’ history in the comics might be brought into it." The co-creator also added that Shredder is a must if it is infact a origin tale, while April O'Neil and Casy Jones have also been mentioned as definate possibilities for the live-action reboot. Elm Street Has its Nancy! Michael Sheen in New Moon? Jolie = A Dame to Kill For?